*A Las Vegas police report obtained by TMZ shows that Flavor Flav violently threw his fiancee to the ground, ripped out her earring, then chased her teenage son around the house while clutching two knives. As previously reported, the Public Enemy hype man was arrested for domestic violence early yesterday morning and subsequently booked on misdemeanor battery and felony assault with a deadly weapon. According to the report, the argument between the rapper and his 39-year-old fiancee started over accusations Flav had cheated on her. 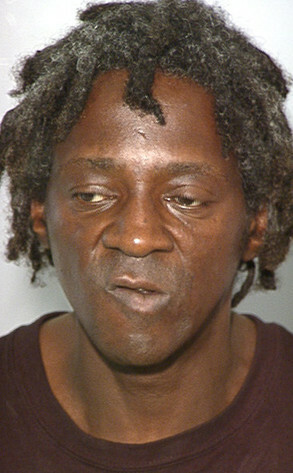 Things turned violent when Flav allegedly grabbed his fiancee and threw her to the ground twice. According to the report, Flav’s fiancee claims her earring was ripped out during the altercation, and her 17-year-old son jumped in to defend her. At that point, the report continues, Flav grabbed two knives and chased her son around the house, eventually kicking down a locked door to get to him. Flav then allegedly threatened to kill him. According to the report, Flav denied chasing the teenager with the knives and the death threat allegations. He posted $23,000 bail and is due back in court next week. WOW!!! Flavv is too old to be acting a fool and how many fiances does this make now??? that pic is scary lol!! I am sorry but any woman in her right mind, has to be Desperate to date him let alone become his wife. My Goodness!!!! If the woman from his episode of Wife Swap is the fiancee they are talking about, she’s beyond off. I’m hoping that it wasn’t her son he was chasing, he was the only person that seemed like an adult in that house. Definitely, not a product of his environment. I’m hoping that whatever she is, she isn’t with Flavor anymore. I can’t see anyone living with someone that would do that. That’s the same one from Wife Swap. I doubt if she’ll leave her life of complete financial support on Flav’s dime. That’s a pretty big kid. I heard that he was getting the better of Flav before he got the knives. Liz’s 17-year-old son, Girard, came to her aid and put Flav in a headlock until he promised to calm down. But, as soon as the teenager released him, he went and grabbed two knives. LAST, BUT NOT LEAST, this is the reason why I think HE should be playing the role of Bobby Brown. She has a 3 year old by Flav so you can imagine the battle for child support if she leaves…which I doubt. Flav will probably send her big kid packing tho.